At a first glance, a pair of chunky baby pink boots probably don't seem like like an economic purchase. There's a reason why most shoes are black; because black goes with pretty much everything! And well, baby pink...not so much. But low and behold, like a kid drawn to candy floss, I ended up buying these boots last time I popped into the Merry Hill branch of River Island. I think it definitely helped that they were on sale for £25, which is a great price for a potentially very versatile shoe. Admittedly, they are not my usual cup of tea in footwear. I usually prefer a less chunky sole on account of my skinny little pins and baby pink is waaaay out of my muted palette comfort zone. But as cut-out boots are going to be a big trend for S/S'14, I wanted to feature them on the blog to show how versatile a pair of chunky boots can be- even a pair of pink ones! If you're new to the pastel game, a monochrome printed jacket and basic tee is a great place to start. A skater skirt also creates a feminine silhouette which is a great juxtaposition with the buckles and heavy soles. When styling these boots with a dress it's definitely best to stick to floaty/flared shapes to compliment your figure- bodycon dresses will really mess around with proportions. And not in a good way. For this look we're drawing inspiration from the indie cindies, and embracing the infamous fedora and polka dot blouse combo. Leather shorts add a bit of raw texture and make it a potential day-to-night look...again note the slightly looser fit and high waist which will really showcase your legs! This also makes a perfect outfit for taking Instagram pictures in the park on a sunny day when it gets a bit warmer. 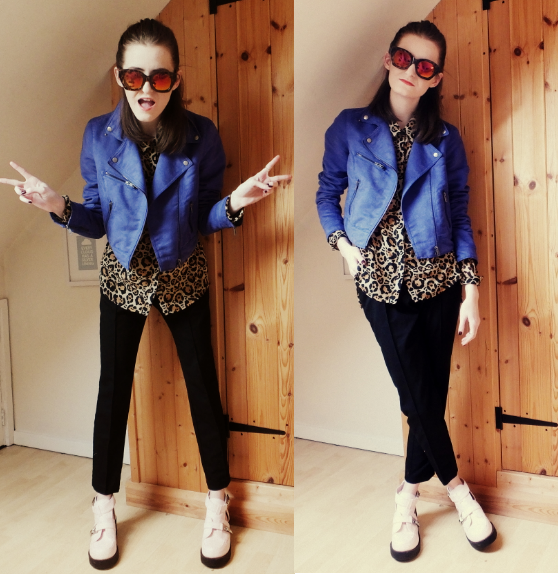 TROUSERS & SUNGLASSES- ASOS | LEOPARD PRINT SHIRT- H&M | JACKET- KHYATI'S WARDROBE! If you're feeling fashion brave, why not throw in a bold cobalt jacket and animal print? 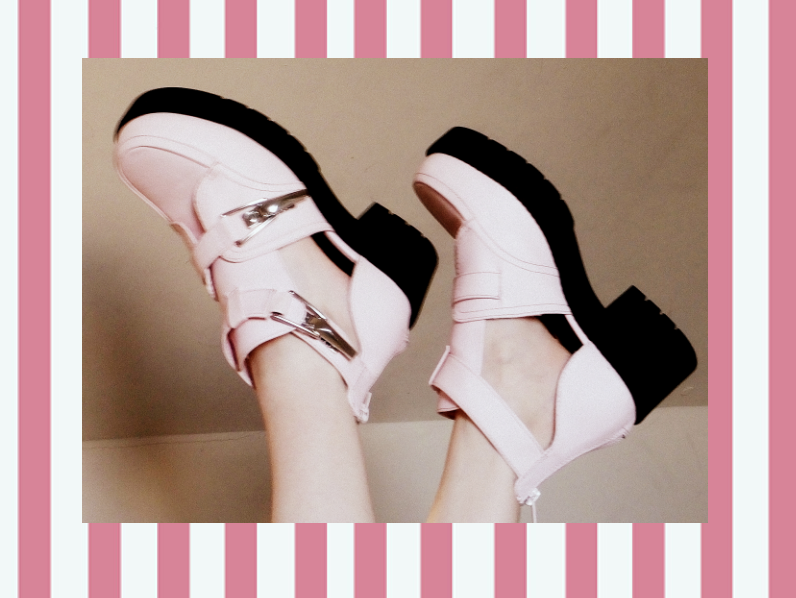 After all, you are wearing baby pink shoes so you might as well go big and bold. If you're not a skirt girl, tapered trousers are a great alternative to jeans - just make sure they're a tailored fit to avoid looking sloppy. And yep, this is how I'd personally incorporate them into my boyish wardrobe. Beanie and bermuda shorts is a bit of a refined taste I guess, but I really like the pairing of the gilet and shorts which kind of creates a makeshift short suit. So, what do we reckon to the baby pink boots? If you're craving a pair of your own, limited sizes are probably still available in River Island @ Merry Hill and online HERE.